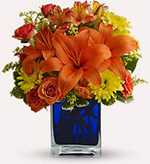 Vibrantly colored fresh flowers infused with meaning are designed to add a special touch to any day or occasion. 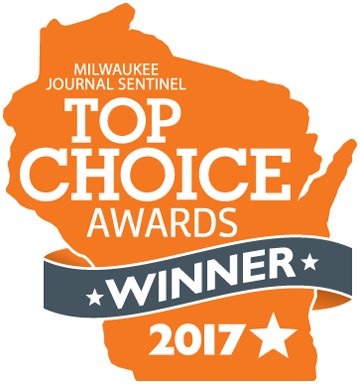 No matter what it might be, Waukesha Floral & Greenhouse will work with you to design and create beautiful floral arrangements. Let our award-winning floral designers make your gift a heartfelt one that will light up that someone special’s day. Choose from ready-made arrangements or from our large selection of fresh flowers—let the type of flower and its color speak for you. Congratulatory flowers show recognition of the grad’s accomplishments while representing a thoughtful gift designed around hope and encouragement. Bright yellow spring tulips and daffodils symbolize fresh starts and rejuvenation. Consider vibrant hues of purple meant to embody energy, enthusiasm and a passion for life. School colors make a great theme for recent graduates to represent their achievements complete with a personal touch specific to them. 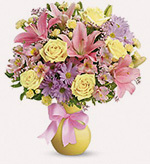 Get well soon flowers represent comfort and joy meant to convey encouragement and bring cheer. Gerbera daisies are believed to bring encouragement and hope—they are a great choice for any friend who is in need of a sweet gift. Representing cheerfulness, yellow tulips evoke a smile with feelings of lightheartedness and joy, and are the perfect pick for any occasion. 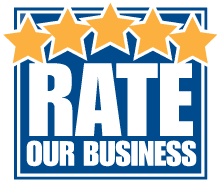 Completely customizable to your special day, Waukesha Floral & Greenhouse offers endless floral options ranging from romantic roses to unique orchids, ensuring your wedding is decorated exactly how you imagine it. Hues of love-inspired red, pink and white delicately illuminate the day, while vibrant colors embody the boundless love and joy that lies ahead. 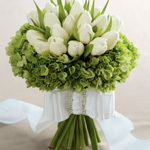 When a bundle of joy arrives, it’s only fitting to send a stunning bouquet or arrangement to congratulate the family. Pink orchids convey affection and sentiment with their delicate, exquisite appearance. Yellow tulips represent new beginnings and express a soft, celebratory touch. 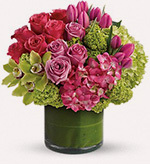 Consider every birthday a special one and send the gift of flowers to a friend, coworker or family member. A thoughtful arrangement of yellow roses, tulips and daisies is always appropriate as they represent friendship and joy—or opt for a vibrantly colored mixture creating a unique arrangement in honor of the celebration. Send your sincerest apologies in the form of a lovely bouquet filled with daisies symbolizing innocence, love and purity, or opt for vibrant sunflowers to bring an unavoidable smile to the recipient’s face. Delicate hues of blue on a hydrangea or iris calm worries while representing peace and soothing serenity. The greatest way to say “thank you” is with a stunning floral arrangement filled with fresh hydrangeas, representing a gesture of heartfelt sincerity and understanding. 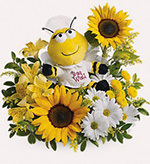 Lighthearted daisies and sunflowers demonstrate your appreciation for that certain someone and promise to evoke happiness. Romantic and timeless roses are consistently used to represent one’s love and affection for another, while red tulips are said to represent perfect, true love. Hues of red and white light up the arrangement. 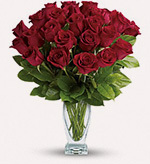 Celebrate the love you have with an arrangement from Waukesha Floral & Greenhouse. A unique green plant represents new beginnings—a perfect choice for a house warming gift or move. An easy-to-grow hydrangea plant, charming azalea plant or stylish assortments are just a few of the available options we offer—all perfectly designed by our expert florists. Just because flowers represent your fondness for another…well, “just because.” Personalize your design with the help of our florists to create a special arrangement anyone would love. Colorful flowers or a blooming plant make sweet, everyday choices that are sure to make the recipient smile. 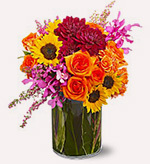 Opt for flowers and colors that remind you of that certain someone to make it more meaningful. If you find yourself at a loss when picking out flowers, it might be easier to start with a color and then let our designers do the rest. Color representations can vary depending on the type of flower—below is a list of general color meanings to help you make a thoughtful choice.